WASHINGTON (CNS) -- In the days since the Nov. 30 death of former President George H.W. 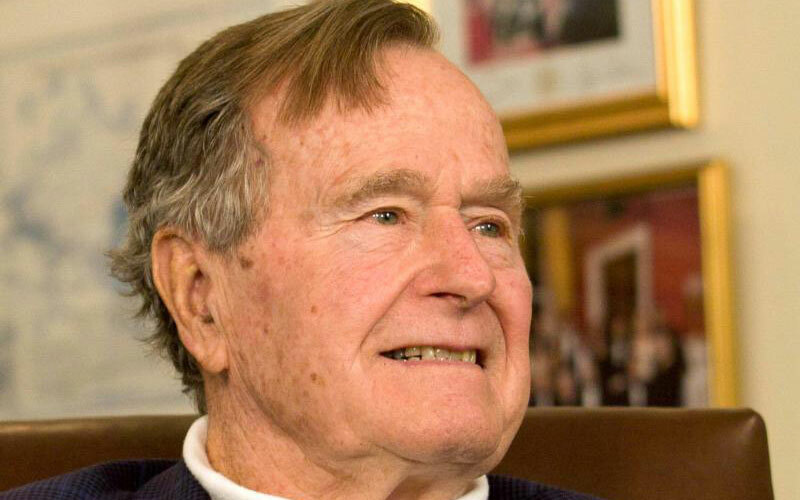 Bush, several news outlets reported that some years ago he told family members that he doubted any one would come to his memorial when he died. After Bush died at his Houston home at age 94, his body was brought to Washington by "Special Air Mission 41" for a state funeral. After arrival at Joint Base Andrews just outside Washington Dec. 3, his body was transported to the Rotunda, and the round-the-clock public viewing period began that afternoon. The viewing ended at 7 a.m. Dec. 5, which President Donald Trump had declared as a national day of mourning. Bush's casket was then transported across the city to the Episcopal Church's Washington National Cathedral for a state funeral. 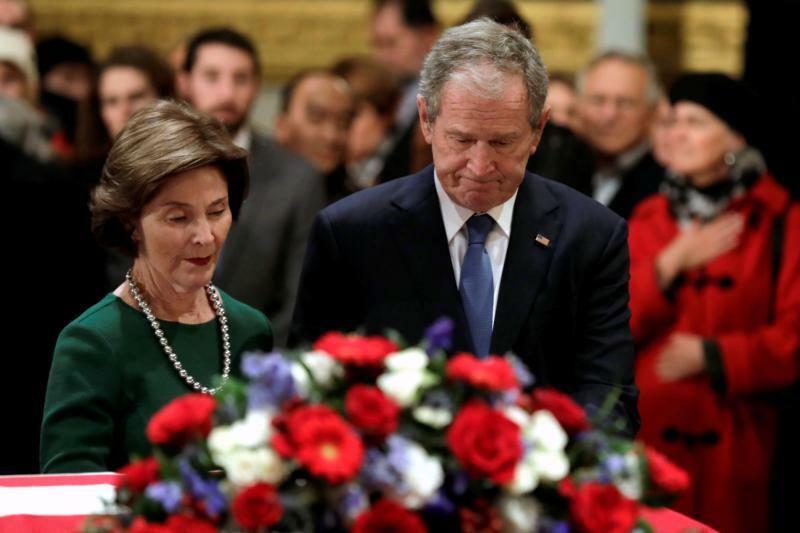 His eldest son, former President George W. Bush, gave an emotional eulogy, breaking down at one point saying his father "the best father any son or daughter could have." He called his father "a great and noble man" who would be remembered as "a great president of the United States, a diplomat of unmatched skill ... and a gentleman who executed the duties of his office with dignity and honor." To the elder Bush's children, grandchildren and great-grandchildren, "his was the brightest of the 'thousand points of light,'" Bush said in a reference to a phrase his father popularized. He had used it in his speech accepting the presidential nomination at the 1988 Republican National Convention in New Orleans and it later became the name of a nonprofit organization the late president launched to promote volunteerism. "In victory he shared credit. When he lost he shouldered the blame," Bush said of his father. "He accepted that failure is part of living a full life, but taught us never to be defined by failure. He loved to laugh, especially at himself. He could tease and needle but never out of malice. ... He was a genuinely optimistic man and that optimism guided his children and made each of us believe anything was possible." Following the funeral, Bush's body was transported back to Joint Base Andrews for a departure ceremony and to return to the Houston area, again aboard "Special Air Mission 41," as Air Force One was dubbed for the journey. An arrival ceremony at Ellington Field Joint Reserve Base in Houston was to welcome Bush's final flight. From there his casket was to be transported via motorcade to St. Martin's Episcopal Church in Houston. AP reported that for hours mourners had already been lining up outside, hours before a visitation was to begin. It is the nation's largest Episcopal church, with nearly 9,400 members. Bush and former first lady Barbara Bush, who died in April, had prayed together beneath St. Martin's vaulted 70-foot arched ceilings as parishioners for more than 50 years. Bush's body was to lie in repose at the church for public viewing overnight. A private funeral was planned for the morning of Dec. 6. From Spring the train will travel through several Texas small towns; the car's windows will offer people views of his casket. The specially designed Union Pacific Locomotive No. 4141 will pull the funeral train to College Station. The engine bears Bush's Air Force One plane's bright blue hues and sweeping lines of "forward motion representing progress," according to Union Pacific. The "4141" designation honors Bush as the 41st president. The trip is 70 miles and should last about two and half hours. While many past presidential candidates have used a presidential campaign train on whistle stop tours, he will be only the eighth president to have used a train as part of their funeral arrangements. Former U.S. President Dwight Eisenhower was the last president to use a funeral train in 1969, when he was transported from the nation's capital to Kansas. In College Station, the funeral train will be greeted by Texas A&amp;M University's Singing Cadets and Fighting Texas Aggie Band in an arrival ceremony near the school's football field. Bush will then be transferred to a final motorcade bound for the George H.W. Bush Presidential Library and Museum.